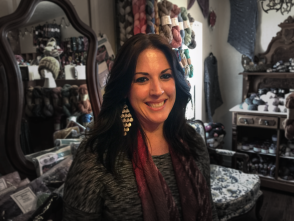 With a desire to promote the needle arts community, Leslie Wolfe opened Isabelle's Parlour in late fall of 2013. With the help of her grandchildren, and son and daughter-in-law as well, she began renovations on a neglected and forgotten building on the property that her landscape contracting company owns. Although the property is 2 ½ miles outside the town of Wickenburg, it is located on a main highway and has good access with plenty of parking. When asked why her shop is in such an odd location, she simply replies, the rent's good! Each season – the shop is closed July to mid-September – has brought expansion. More yarns keep coming in and the footprint keeps being enlarged to provide a more comfortable 'parlour' for those wanting to come and spend the day knitting. Classes are available and inspiration covers the walls and shelves. Although you'll find plenty of wool here, there is also a wonderful selection of silks – Leslie's favorite fiber! - linens and cottons for our more temperate climate here in the desert. And to answer the most commonly asked question – who is Isabelle? - well, that's Leslie's mother, the most amazing seamstress and knitter ever! 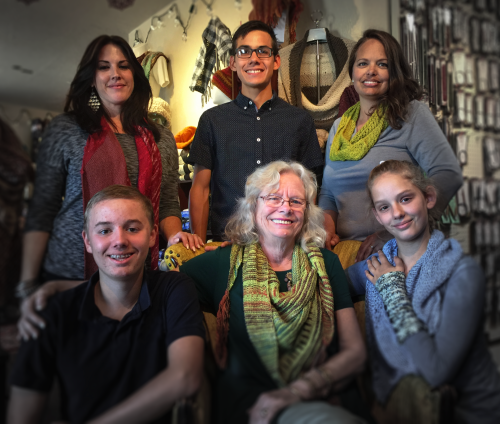 15 years, or so, ago, when she began her jewelry business, Leslie wanted to honor her mother and everything she had instilled in her, so the business became Isabelle Designs. When she tired of the seasonal craft fairs, it was her husband who quipped, why don't you set up the spare apartment behind our house as a studio with your yarn, sit and knit and the customers can come find you. Well, that thought just kept growing! And, again, it was her husband who suggested Isabelle's Parlour - that way the ladies can come sit in your parlour and knit with you, he said. And so here we are, more than 5 years later, exploring the amazing world of fiber, the arts that make them a joy and the people who bring such a special creativity to inspire and amaze! 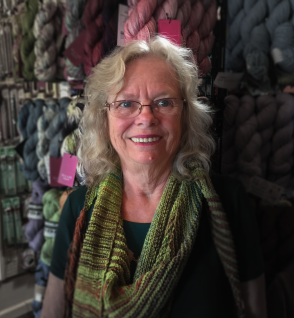 With the eye of a life-long seamstress, and a knack for color and texture, Leslie loves helping customers choose yarn for a particular pattern or the perfect pattern for a favored yarn. It's like I get to enjoy the process vicariously! she quips, because there's just not enough time to knit all the things I want. She learned to knit in her early 20's, her first project being a fair-isle sweater for her husband. Enjoying the challenge of the colorwork section but struggling to finish all that stockinette - and 2 sleeves to boot – she proudly presented it to him. But pullovers weren't his thing and he never wore it, so crochet became her next love. Throughout her life, whenever there was a baby arriving or gift needing to be done, crochet became her go-to craft. But, several years ago, with the yarn shop in the planning stages, she decided it would be a good idea to start knitting again. That's when she discovered knitted lace, and, as they say, the rest is history! Being a kindergarten teacher in her church's private school, Janice was first introduced to knitting when her mother-in-law, Leslie, volunteered to teach a semester of knitting to the elementary grades. Leslie needed the teacher's help and participation, so Janice's journey into the world of needle arts began. And when the shop opened, she gladly offered to come in a couple afternoons a week to work. 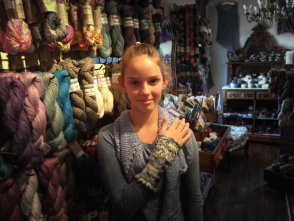 When asked by family or friends to babysit or run errands, she just smiles and says – Sorry, I have to work - and comes in to the peace and serenity of the shop and knits! 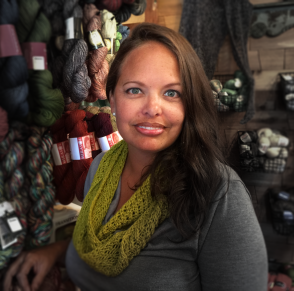 Her skills have increased each year, and she is currently working on a sample cowl and will be teaching the class this November. Beth is new to our line-up this year. She and her husband, Chris, have relocated to Arizona to help in the family business. Without her help and computer savvy, the new point-of-sale system never would have happened, while Chris is responsible for all the wonderful photography on the web pages! Beth is new to knitting, also, but since she's Leslie's daughter, she figured she'd better learn! And helping in the shop will just increase those creative juices, so when she finally gets a chance to open her pottery studio, her hands will be ready for the wheel. Grandson Nathaniel, now age 15, has been helping in the shop for 3 years. He learned to knit back in that Creative Arts class in his school, and still enjoys the projects he works on. 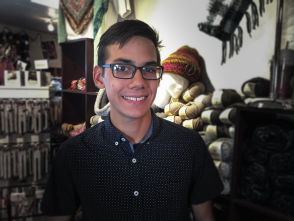 Although knitting will probably not be a career path for the eldest grandson, he certainly does love to help in the shop. His customer service skills improve every year and he loves the attention he gets from all the customers. He knows all the yarn, can direct customers to correct needle choices and loves to ring you out when the browsing is done. He'll even offer to carry your purchases out to the car! 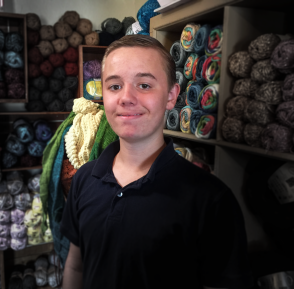 When Caleb was 10 – 12 years old, he used to spend many an afternoon at his grandmother's bead shop, helping with the inventory, learning how to string beads and repairing customer's pieces. His attention to detail and persistence was evident even at that age! So when Leslie, his honorary grandmother, asked him to help out in the shop that first year, he was delighted. You'll have to learn to knit, was her response to his acceptance of the job, and he replied – absolutely, no problem. Now graduated from high school and working hard to grow his father's part-time car detailing business, he still finds time to help out at the shop, and he loves it. The regulars sure do love him, too! He's helpful and his knowledge of the products is amazing, he loves a beautiful yarn as much as any of us do. As his business grows, we'll probably be seeing less and less of him, but he's promised to be here for any special event, and that makes him all the more special! And lastly, Kathryn is the youngest grandchild, the only girl. She also learned to knit at her grandmother's Creative Arts class and has become proficient in finger knitting as well. She even taught a Make 'n Take class on that at one of our Open Houses. Although she's just 11, her desire to learn and grow belies her age. Leslie was teaching a beginner crochet class and Kathryn was so entranced, she begged to learn as well. Well, Grandmother said, you have to finish that shawl you're working on first, so within days it was done and she was back asking for lessons! Her first project was a crocheted bag with the round, plastic handles. She finished it in no time and gave it to her Mom as a Mother's Day present. Very impressive. So, this year, she starts working formally, and we know she'll be an asset to the shop for many years to come.